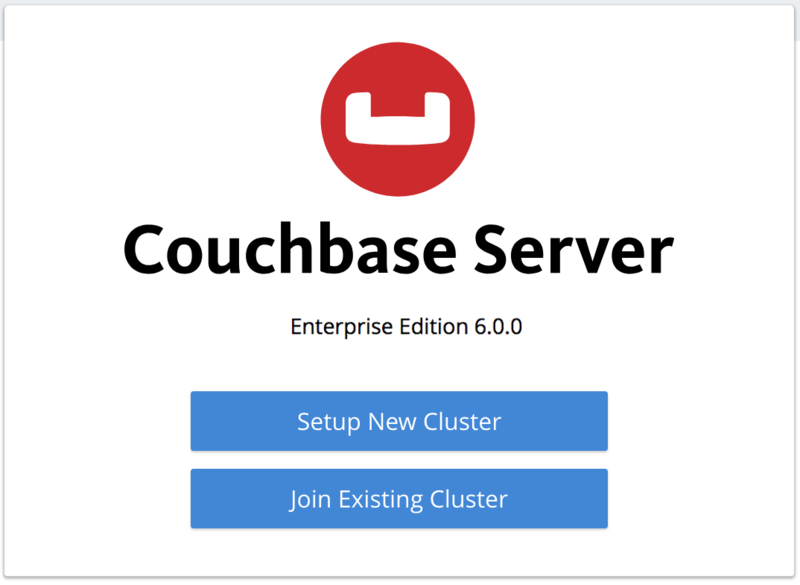 A new Couchbase Server node can be added to an existing cluster. Full and Cluster administrators can use the UI, CLI, or REST API to add Couchbase Server nodes to existing clusters. On each node to be added, Couchbase Server must have been installed and started. The process of node-addition grants to the new node the settings already established for the parent cluster. (See Manage Settings for details.) The process allow services to be assigned to the new node. If the new node was previously initialized with custom disk-paths, these are retained. 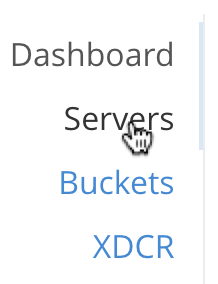 All aspects of provisioning that may previously have occurred on the new node are eliminated: this includes buckets, services, and settings. This shows the name of the sole node in the cluster, 10.142.181.101, plus additional information, including the services hosted. 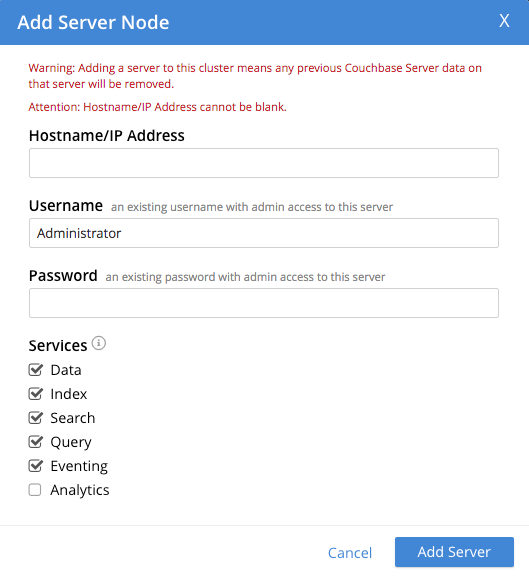 This indicates that Couchbase Server is installed and running on the new node, but has not yet been provisioned. 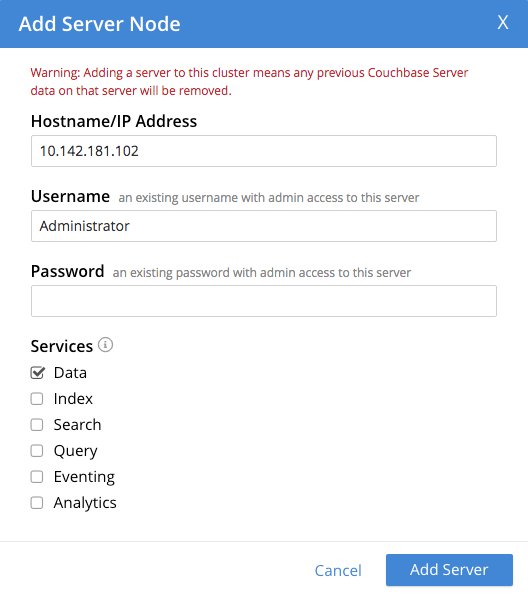 Do not use this interface: instead, return to Couchbase Web Console for the cluster, 10.142.181.101. This indicates that the new node, 10.142.181.102 has been successfully added. However, it is not yet taking traffic, and will be added following a rebalance. Note, at this point, the figure under the Items column for for 10.142.181.101: this is 31.1 K/0, which indicates that the node contains 3.1 K items in active vBuckets, and 0 items in replica vBuckets. Meanwhile, the Items figure for 10.142.181.102 is 0/0, indicating that no items are yet distributed onto that node in either active or replica form. To add a new Couchbase Server-node to an existing cluster, use the server-add command. Note that this command requires that arguments be provided for its --server-add-username and --server-add-password flags. In this case, meaningful arguments do not exist, since the new node features an instance of Couchbase Server that is running, but has not been provisioned with a username or password. Therefore, specify placeholder arguments. Additionally, specify that the data service be run on the node, once it is part of the cluster. Note that when the operation is highly complex, it may be desirable to get status on its progress, or stop the operation. See the command reference for rebalance-status and rebalance-stop, for more information. For further information on adding nodes with the REST API, see Adding Nodes to Clusters; on rebalancing, see Rebalancing Nodes. As well as supporting a cluster’s adding a node to itself, Couchbase Server also supports a node’s joining itself to a cluster (which is essentially the same operation, but proceeding from the node, rather than from the cluster). See Join a Cluster and Rebalance for details.